11 September 2018, at 12:00a.m. The term “exotic” can mean several things. Setting aside “unusual” or “strange”, exotic might be interpreted as something that isn’t where it should be. For most, if not all, exotic pets (ie pet wildlife), that pretty much sums things up. And if something really ought not to be here in the first place, how can a casual acquirer of a quotient of nature hope or plan to make good on a self-promise or a pet peddler’s assurance that taking care of this hapless “misfit” will be straightforward? Relatedly, companion animal establishments (eg pet shops, breeders, boarding kennels and sanctuaries) that supply or salvage exotic and domesticated species have long operated without consistent solid guidance on husbandry and facility assessment. Here, we take another look at alleviating some old problems from two new angles – a pet labelling scheme to promote informed decision making by pet acquirers and evidence-based guidance on husbandry and inspection. Mis-marketing wild animals as “easy” or “beginner” pets largely sets up animals and people for some nasty falls. Whether from seller ignorance or deceit, sales pitches are as crass as adorning one’s bearded dragon in a Batman outfit as if it were the most natural thing in the world. Well it isn’t! It isn’t about being “bad” people either. It is about bad decisions and bad information leading to those decisions. With over 13,000 species in trade and keeping, any one of which can present at local vet clinics, many vets recognise that traders and public are not the only ones ill-equipped to cope, as they themselves become actors in what is a very diffuse story of “battlefield medicine”. Research among vet professionals and allies indicates that exotics score relatively low estimates for suitability as pets. Indeed, at the 2017 London Vet Show, the Animal Protection Agency polled attendees, asking whether greater controls, eg a “positive list” of approved-only species in trade and keeping, were warranted, and an emphatic 512 to 1 (a pet seller) said “yes”! A major recurring obstacle to progress on welfare, public health and safety, species conservation and invasive “pest” issues has been the catastrophic failure of efforts to educate people once animals arrive in their homes. In recent years, numerous published studies have concluded that zoonoses warnings fall on deaf ears; neither so-called “hobbyists” nor regular Joe pet “owners” follow care advice well. In July 2018, a PDSA report found that one in four people conducted no research at all before getting a dog, cat or rabbit. Miseducation by sellers and “hobbyists” along with “information uptake inertia” by keepers frequently render objective advice unwelcome or inconvenient – so fingers and ears rapidly become acquainted. Changing mindsets in the home works poorly, so it makes sense to provide objective pet labelling at point of sale and to provide consistent evidence based guidance to those who oversee animal establishments. Product labelling in general has been a big hit – consumers now check out salt, sugar and fat contents before heading to the till. Yet while food, white goods and even soft toys are commonly labelled with cold, hard facts to protect buyers and extend product lives, no such safeguards are in place for sentient creatures. 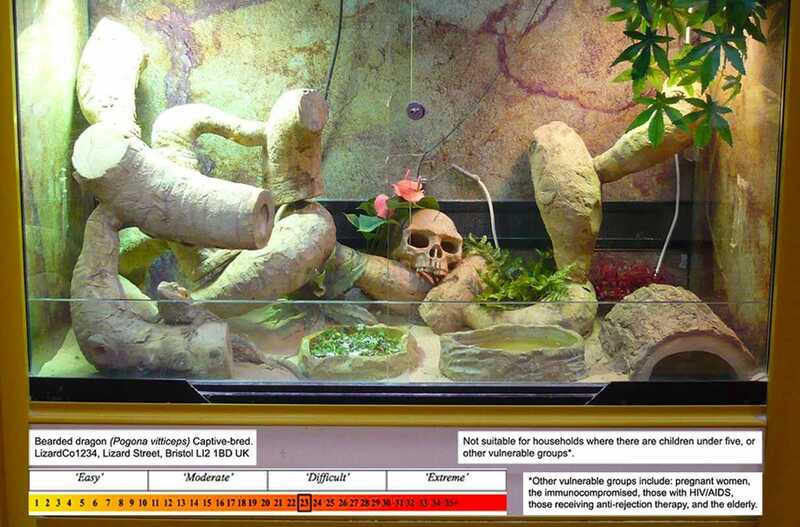 Accordingly, a detailed review of exotic pet suitability and labelling was recently published in the Journal of Veterinary Behavior. A key conclusion is that pet labelling is required and needs to be entirely independently and objectively formulated – ie free from convenient claims by sellers. The scheme proposes the EMODE (easy, moderate, difficult, extreme) system as the tool to score how challenging an animal may be to keep, along with basic information regarding zoonotic risk and supplier details (Figure 1). Objective pet labelling promotes better-informed decisions and is essential for both “consumer” and animal protection. Point of sale labelling may, at last, also allow “us” to get ahead of the problem and reduce impulse or misled purchases. Whereas getting traders and keepers on board with objective information is more than challenging, professional inspectors recognise their obligations to use evidence-based guidance. A key issue has been developing information based on durable, universal, consistently applicable evidence, uncompromised by influences from vested interests. Since 2012, a team of biologists and vets has been working on that information challenge, and following exhaustive internal and external reviews, the new guidance has now appeared in the journal Frontiers in Veterinary Science. The guidelines adopt universal management principles for the organisation of establishments as well as “safety net” husbandry, including: facility layout; quarantine; behavioural needs; negative welfare signs; zonal climate-based captive parameters; enrichment; and more. In all, over 40 sections and 14 tables of scientific information are detailed, plus a dedicated tool for scoring facility conditions – offering the most comprehensive and definitive objective resource worldwide. And it’s all free! More than most, the veterinary profession is familiar with the results of the husbandry failures that accompany bad decisions. And more than many, vets occupy roles as formal inspectors charged with safeguarding animals, people and the environment. Time will tell whether these new initiatives glean meaningful results, or whether greater efforts should be directed at strict trade bans and conscientious enforcement. Clifford Warwick, PGDip MedSci, CBiol, CSci, EurProBiol, FOCAE, FRSB, qualified in biology in 1990 and in primary healthcare in 2004. He has been a field investigator of the wildlife trade and has produced around 150 publications in animal biology and human medicine.